SYRACUSE — Despite the postponement of the Wawasee Snowmobile Drags and ice fishing contest to Saturday, Feb. 11, the 2017 Wawasee Winter Carnival soldiered forward on Saturday, Jan. 28, and a good time was had by all. The festival began Friday evening with the Kiwanis soup supper and activities continued through Saturday afternoon, culminating in the Polar Plunge from the Oakwood Resort beach. 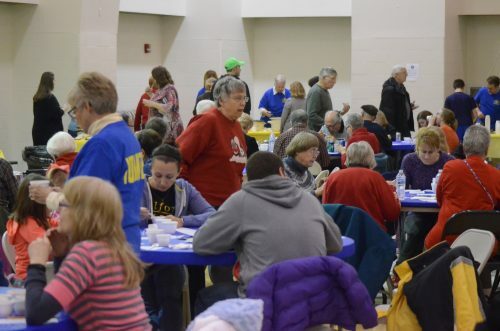 The festivities kicked off with the eighth annual Kiwanis Soup Supper from 5 p.m. to 7 p.m. at the Syracuse Community Center. 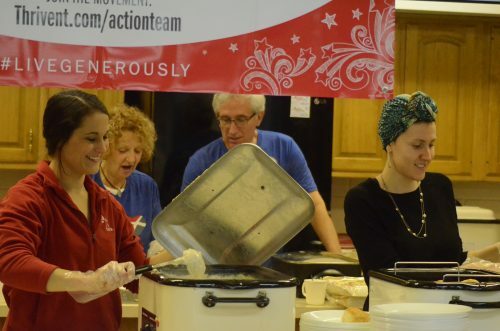 The event included 19 homemade soups, a 50/50 raffle and desserts and drinks. Patrons paid $6 apiece and picked up a ballot at the entrance to vote on their favorite soup. Proceeds from the supper will go to several local youth related community projects. Raffle proceeds will be donated to Riley Children’s Hospital. blustery winds from the starting gate at Schrock Athletics Complex. 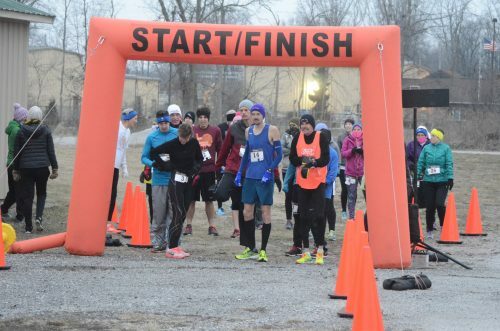 The event was sponsored for the first time by the Syracuse-Wawasee Trails, who will receive the proceeds from registration. For the second year, Grace Lutheran Church hosted a biscuits and gravy breakfast to raise money for Teen Parents Succeeding. The event was made possible by an action grant from Thrivent Financial, a not-for-profit financial services organization. 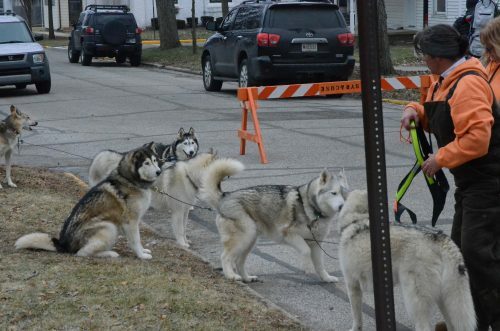 About a dozen church members and TPS volunteers helped make and serve the breakfast, which ran from 8 a.m. to 10 a.m.
Several teams of huskies and other sled dogs took to Main Street at noon to demonstrate sled pulling. Because of the lack of snow, the teams pulled wheeled carts. Belva Dreer of Fort Wayne presented the demonstrations, which were hosted by Lakeland Youth Center. 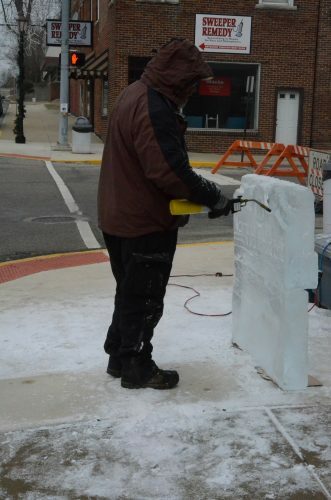 Two ice carvers collaborated to produce five ice sculptures dotted along downtown Main Street. Ryan Frauhiger came in from Bluffton to produce a couple of the ice carvings in his “first gig.” He has been carver for only a couple weeks, but has had useful experience in his trade as a chain saw artist. “I just apply the chain saw principles,” he said. “The only differences are the medium and the temperature. The other ice carver, Patrick Hunsley, provided the 300-pound ice blocks from the company he works for in Laporte. “We were commissioned by the festival,” said Hunsley, who has ice carved for about three years. The carvers used chain saws, chisels, ice picks, aluminum plates, irons and blowtorches to produce their creations. The final and best attended Saturday event was the “Freezin’ For a Reason” polar plunge from the beach of Oakwood Resort. The reason was to raise money for Boomerang Backpacks for Wawasee Schools. Nine intrepid divers took the plunge, monitored by two wetsuit-clad members of the Kosciusko County Sheriff Department’s dive team. Members of the Wawasee Middle School chapter of Fellowship of Christian Athletes served hot chocolate for the participants and crowd. Two trios of participants appeared in playful regalia. 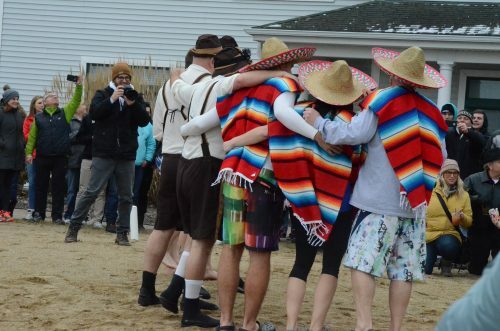 The Brewmeisters wore lederhosen and the Three Cold Amigos sported sombreros and serapes. The Three Cold Amigos — David Ganz; Cory Kuhl; and his wife, Ashlee — all graduated from Wawasee High School. This year’s plunge was the first for all of them. “It’s for a good cause, and I’ve always wanted to do it,” said Ganz. The trio entered into a “group suicide pact” beforehand to “go all in,” completely submerging themselves in the 34-degree water. “We all drank the Kool-Aid,” said Ashlee. Andy Cripe of Syracuse dove alone. His wife, Susan, is co-coordinator of the local backpack program. Susan explained the low turnout of divers this year. “Our success is based on whether there are snowmobile races,” she said.